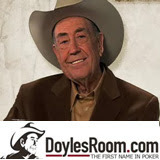 DoylesRoom.com is giving online poker players the opportunity to face poker legend Doyle Brunson in a big money heads-up online cash game. The top poker site concludes it Summer Series of Freerolls with a no buy-in $25,000 Grand Finale event, where the winner will play poker legend Doyle Brunson for an additional $25,000! Yes, it’s true - the winner of the Grand Finale will get the opportunity to play heads-up against the great Doyle Brunson, the biggest name in poker. The Grand Finale Freeroll will take place at 7:30pm GMT on Wednesday September 19th. To play, simply register at DoylesRoom.com, where you will find the $25,000 Finale Freeroll, labelled in green under the Freerolls list option of the multi-table tournaments (MTTs). To get into this fantastic freeroll simply play 25 raked hands (minimum 25 cents in rake) in the ten days before registering for the tourney. The winner of the Finale Freeroll will not only win the first place prize money in that game but will go forward to a heads-up match against Doyle Brunson on September 30th. If he or she can beat Doyle heads-up, in addition to the ultimate bragging rights, they’ll walk away with a further $25,000.